Connected home appliance refers to the next generation appliances which are equipped with advanced features for receiving, processing and transmitting information through different sources such as smartphones, tablets and laptops. Further, the main features of connected home appliances are security and comfort, in addition connected home appliances provides home with smart devices and automated technology. The global connected home appliance market is expected to expand at a robust CAGR over the forecast period i.e. 2017-2014. Factor such as, increasing demand of internet structure availability and increase in smartphone penetration rate are anticipated to increase the growth of global connected home appliance market over the forecast period. In the regional market, North America is projected to dominate the overall connected home appliance market during the forecast period. Factor such as, increasing purchasing power and changing lifestyle of people is expected to positively impact the growth of connected home appliance market over the forecast period. Moreover, advancement in technology is anticipated significantly for the growth of connected home appliance market in North America. 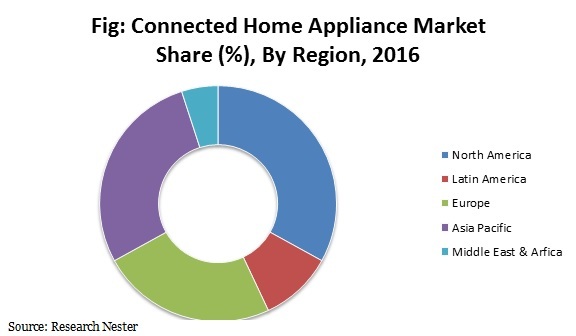 Asia Pacific connected home appliance market is poised to grow at a poised rate over the upcoming years. Moreover, increasing number of smart phone in the region is fostering the growth of global connected home appliance market over the forecast period. Europe region is expected to observe outstanding growth in the upcoming years. Increase in the security concerns is anticipated to drive the growth of global connected home appliance market over the upcoming years. Factor such as, rising demand for adoption of various connected home appliances across the globe is anticipated to intensify the growth of global connected home appliance market over the forecast period. Further, high availability of home broadband connectivity is expected to positively drive the growth of the global connected home appliance market over the upcoming years. In addition, increasing adoption of various cloud based technologies enhanced with home appliances is anticipated to be the dynamic factor behind the growth of the global connected home appliance market over the forecast period. According to IHS technology, over 1 million units of smart gadgets were used in 2014, which is expected to increase upto 470 million units in 2020.This factor is likely to further strengthen the growth of global connected home appliance market over the forecast period. Moreover, increasing number of smartphone user across the globe is expected to robust the growth of the global connected home appliance market over the forecast period. However, high cost of equipment and lack of awareness of consumers are some of the key factors which are expected to limit the growth of global connected home appliance market over the forecast period.